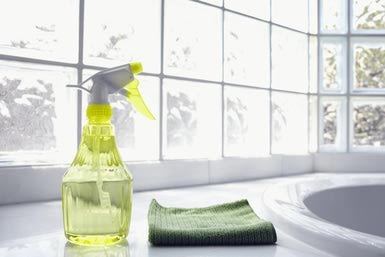 Safe and Eco-Friendly Cleaning Alternatives. Cleaning is daunting enough without the realization that many of the store-bought products actually contain some nasty stuff you just might not want to be spreading around your home–especially if you have children and/or pets. Do-it-yourself green cleaning is the way to go. Natural Grout Cleaner for the Bathroom – a little elbow grease, some vinegar and baking soda or non-toxic oxygen bleach or even a steam cleaner can remove even the most stubborn grout grime. Homemade Furnish Polish – yes, even furniture polish can be green. Simply mix olive oil, lemon and water and use a soft cloth to polish your wood pieces free from dust and to add a protective layer. Tub Cleaner – You can make a simple bathtub cleaner from half of a grapefruit and kosher salt, it really doesn’t get much easier or green cleaning than that. DIY Fabric Softener – commercial fabric softeners (especially those dryer sheets, which can contain animal fat) contain all sort of things you actually don’t want touching your clothing and skin. Make your own instead from vinegar and essential oils for a green cleaning alternative. Homemade Ironing Spray Starch – add a little crispness to your cotton and linen fabrics by using homemade spray starch when you iron. It’s as easy as mixing cornstarch and water. DIY Citrus Spray – need an all-purpose spray that’s safe for kitchen counters and anywhere little hands can touch? Make your own homemade citrus spray by soaking orange peel in vinegar. All-Natural Air Fresheners – air fresheners, in addition to really just overpowering your home with scent, can contain some really nasty stuff–chemicals like formaldehyde. Instead of spraying toxins in your home, make your own odor-absorbing air freshener by using a mason jar, baking soda and essential oils. Homemade Mandarin Mint Glass Cleaner – Make your home smell nice while doing the dirty job of cleaning windows with a simple green cleaning window spray. Mold Banisher – Need something a little more powerful to clean your bathroom, basement or other damp area? Mix vinegar and tea tree oil together. One word of caution, use tea tree oil with care around pets and kids. Server responsed at: 04/19/2019 4:42 a.m.